Black Friday is almost here. The Christmas shopping season is just beginning and you're already starting to sweat. Your shopping list grows by several names each year, with new in-laws, co-workers and friends to think about. You've got long lists of tech gifts that they want, whether it's a fun stocking stuffer for about $10 or a 4K TV for hundreds of dollars. We can ease your mind. You don't need to spend hours researching tech specs for gifts and endlessly scour online sites and shopping malls for the best values. We've done the work for you, notably for Android smart watches. It's all part of Kim Komando's plan to save you time and money when it comes to buying tech gifts. You'll be surprised, though, by our pick for the best Android-compatible smart watch this year. Keep reading for our pick for No. 1 and keep reading for a BONUS runner-up. I know what you're thinking, "Fitbit isn't a smart watch." You've probably used Fitbit fitness trackers. They are small, lightweight and pack a serious punch when it comes to helping you stay healthy. Most fitness trackers tell you how many steps you walk. They track your heart rate and many of them track your sleep. But Fitbit now has watches built into most its models. Fitbit purchased the smartwatch company Pebble a couple of years ago. This is great news for everyone on your shopping list. Fitbit's new Ionic smartwatch has all the features you'd expect from a smartwatch - it shows the time, alerts you when you have a text message and plays your favorite tunes. It also has all the features you'd expect from a fitness tracker, like personal coaching. It has built-in GPS, it is water resistant and has an impressive Lithium-polymer battery life of about five days (10 hours or with GPS running). The Fitbit Ionic has a big, bold and bright display. It has a touchscreen display with Corona Gorilla Glass 3 with 1,000 NITS - a measure of brightness. It uses the Fitbit OS operating system and has apps like digital payments. You can listen to music from Pandora and listen wirelessly with Bluetooth 4.0 technology. The Ionic is packed with tech that tracks your activity, movements and health. It has an altimeter plus 3-axis accelerometer and gyroscope. It has enough memory to store about a week's worth of your activity. It stores your heart rate at one-second or five-second intervals, depending on your activity. 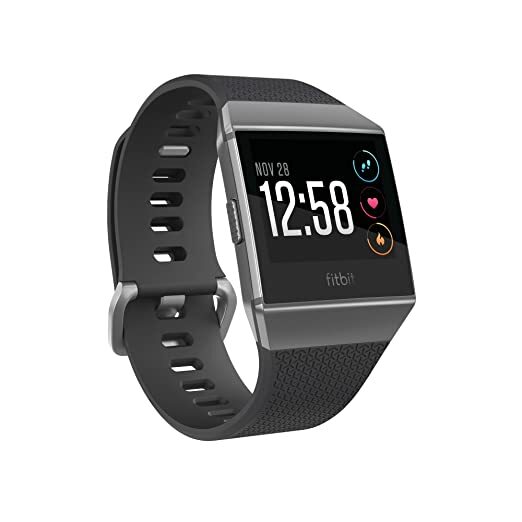 Fitbit Ionic GPS Smart Watch, Charcoal/Smoke Gray, One Size (S & L Bands Included), save $70, now $199.95 on Amazon. You may find that the Samsung Gear 3 is just about the perfect smart watch for Android users. It has two features that someone on your Christmas shopping list will say are must-haves. First, it's designed to look like a traditional watch with moving hands and numbers on its face. But it's a smart watch, so you interact with apps by turning the bezel. That unlocks apps like messages, music, fitness tracking and the weather. Just twist and select. Second, a feature long missing from many smart watches - you can make phone calls directly from your Samsung Gear 3. It has a built-in microphone and speaker, so you can leave your phone at home! The Gear 3 is water resistant and it has a battery life of up to four days. You can charge it wirelessly on a charging station. The Gear 3 has loads of features, including digital payments. It works with both Near Field Communication (NFC) and Magnetic Secure Transmission (MST). You can listen to music using Bluetooth headphones. It has 4GB of memory. It also works like a smart speaker. It uses S Voice so you can use your voice to set reminders, like pick up the kids from at school at 3:00. Of course, it has fitness tracking apps - it wouldn't be a great smart watch if it didn't. Plus, it has an altimeter, barometer and speedometer to help you keep track of your workout and the weather conditions affecting it. Samsung Gear S3 Frontier Smartwatch (Bluetooth), save $150.98, now $199 on Amazon. Good news! We've done the research for you, so you can save time and money. Here are five smart watches that your spouse, kids and grandchildren will love. Which one will you buy for yourself? Click or tap here for 5 great smart watch ideas for Christmas!